Just to give you an idea of the level of skill involved in being a circus “écuyère” or haute école rider in the nineteenth century, here’s a routine of the great Baroness Jenny de Rhaden, taken from Hilda Nelson’s book. Every écuyère had a team of three horses, two for haute école and one “jumper” who could also perform haute école movements. The horses were usually stallions. 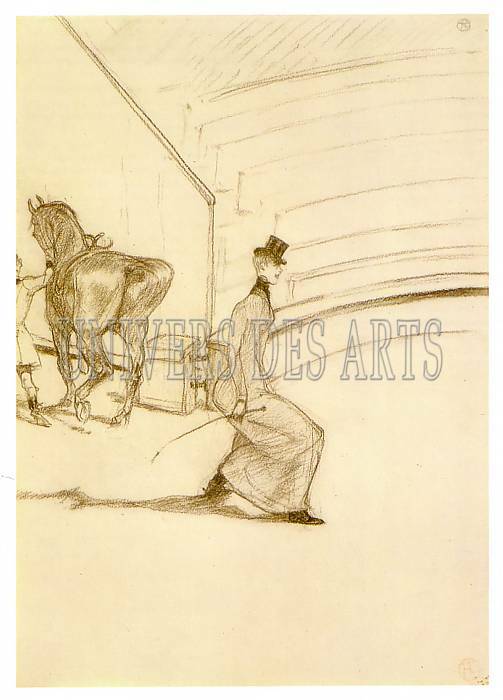 Enter ring with a lançade followed by a courbette taking Jenny and mount right up to the edge of the orchestra pit. Side steps to right and left, then walk transitioning into a rapid canter, at which pace they turn several “volte” or six-pace circles in each direction, before switching to flying changes at three, two and one tempi. Horse and rider pirouette and then perform the high-stepping Spanish walk, followed by what was referred to as a passage at the time, and, if I read Nelson correctly, was a half-pass. Enter at gallop and pirouette centre stage. The horse rears to its full height and walks on its hindlegs before making the révérence (a bow) to each of the four corners of the stage. Four fences are placed in a square in the centre of the ring. They leap each of the jumps, which are then cleared and replaced by parallel bars which edge the ring. Jenny and the horse leap these in succession. The horse rears upright once more and Jenny lies back on his quarters, her hair almost trailing the floor, as he takes a few steps. Once at this venue the horse, Da Capo, overbalanced and fell on Jenny, who was lucky to survive with a mere lump on her head. She only had a top hat for protection. Jenny enters the ring on foot to receive her applause. Czardas (a “tiger” spotted stallion) gallops in and kneels before her, then lies down. She perches on his rib cage and goes on saluting the audience. The curtain falls. This routine was performed at the Folies Bergère on a sloping stage eight metres square, covered with coconut matting. 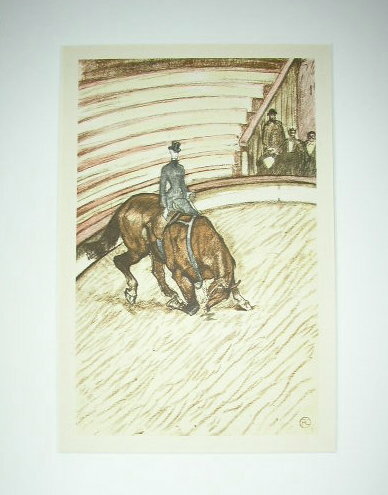 Nelson says Jenny was painted by Toulouse-Lautrec, and a quick search of his écuyère paintings throws up this (a révérence), this , and (the écuyère curtseys), and this (an écuyère rides one horse while long-reining a second). German-born Jenny wrote her own autobiography, Le Roman de l’Ecuyère which appears to have been turned into a film in 1910. Her life (according to Jenny) was a rollercoaster of melodrama, thanks, in part, to her widowed father losing all the family’s money when she was seventeen, and her subsequent marriage to a passionate, duel-happy Baron who seems to have challenged Jenny’s admirers to fight in every city they visited. In Copenhagen, he killed a young lieutenant. She made her last performance when both she and Czardas were blind – the horse had lost his sight to the bright lighting used in the circuses, and Jenny spontaneously lost her vision, perhaps as a result of that earlier catastrophic fall. The result was as disastrous as you would expect: they fought one another, the audience reacted in horror, Jenny was thrown and fell against a column and remained in a coma for a week. Czardas was later shot. Jenny went on to a grim retirement, struggling to adapt to blindness, and penning her memoirs to try to make sense of all that had happened. 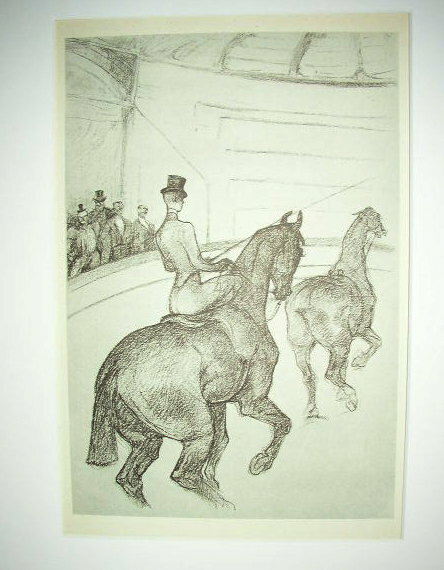 This entry was posted in 1800s, Appaloosas, Circuses, Dressage, Equestrian Art, France, Germany, Haut Ecole, Paris, Sidesaddle, Theatrical Equines, Women and tagged Baroness Jenny De Rhaden, Dressage, Folies Bergères, Haute Ecole, Haute Ecole in circus, Hilda Nelson, Jenny de Rhaden, Nineteenth century haute ecole, Parisian Circus in the nineteenth century, Sidesaddle, sidesaddle dressage, The Ecuyère of the Nineteenth Century in the Circus, Toulouse Lautrec, Xenophon Press. Bookmark the permalink.